Believe me that there is no perfect trading strategy exists.Even legendary trader george soros investment accuracy is 50%. Stop searching for 90 % accuracy. Concentrate on higher risk/reward trades and trade with discipline.I am making money only with 40 to 75% accuracy. have you tried fundamentals ? I have trust problems with paid courses, but looks like all his videos are available to view in his trial. I'll try it out, thanks. What more fundamental/news/economic courses are out there for trading? I'll still keep looking for a good trading strategy. Psychology/money management is important but if your trading strategy doesn't gives good statistical results, you won't make money. I hope you are trading on a DEMO account because hit-and-miss self-training can be very expensive. People make money with a lot of different systems because they match the system to their personality as well as account balance. It isn't a question of trying systems until you find one that is profitable because making a system profitable is a problem of execution of the system. Using a 50/100 moving average crossover would mean you would have to allow for a large price swing or you would be stopped out fairly quickly and often. Have you tried Renko charts? They are based on price movement and not time and I think that it is easier to see the price trends with a more defined risk. There is an article on Renko in this website and there are demonstrations of the use of Renko charts in YouTube which you can see just by searching "Renko"
I focus on Renko charts and you can follow my trading logic on a forum post and in my profile page. I don't update every day but I try to explain my system. This gets me into good discussions with other Renko traders. If you need the EAs and indicators for Renko I can send them to you. There are several around if you are interested but I can give you some I find profitable but they are NOT robots. I have tried to make auto-trading robots but I make much more money manually. Good luck. You need to keep trying systems and getting experience on DEMO accounts and you can di it WITHOUT sending anybody a money. I have spent thousands of dollars on robots and systems and for me I make better money with simple free systems. After all, there is only H, L, O, C, and volume and everybody has the same information. You need a system you can trade easily and consistently otherwise no system will work for you. 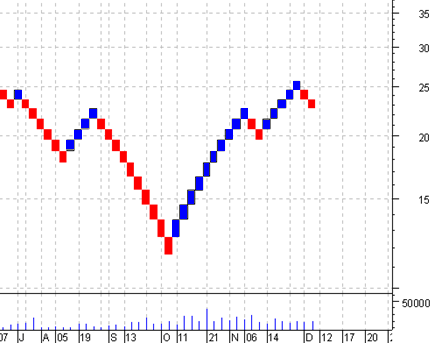 Do you think you understand the Renko chart attached and how you might trade it? My profile page has other examples. Try to sell the weak and buy the strong currency. Look at the whole market what is does and not just one pair.